« Wednesday – Hooray Another All Important Inventory Day!!! Yesterday's report on gasoline was a bump in the road and not the beginning of a mega rally in gasoline prices and the refining sector. It all boiled down to a hiccup in gasoline imports. Without that hiccup, inventories would have grown easily over estimates. I see RBOB falling back to the $2.10 level next week if no storms or major geopol drive it over $2.20 first. A word of caution: Nicki says that if it put in a bottom at $2.10 and that yesterday was the first leg up it "should explode from here" and I'm not one to argue with her on the futures. Which dovetails nicely with point 3. What do I do if I'm in refiner puts? A) when in doubt sell half. My put position there is very small after the rending I took on the way up in May as I was very cautious scaling back in. B) exercise extreme caution and wait for next week's number before DD'ing if that's your inclination. Natural gas is likely to rally once injections fall back into double digit territory. Does that happen today? Maybe. Imports have dropped sharply for two weeks with no response in inventories last week. I'm thinking 95 Bcf but more on that below. OIH is likely to head higher. It needs bullish natural gas and oil over $65 to do so but they are just printing money right now...without out all the angst associated with the knowledge that the good times are freakily peakish and cannot last (like in the refining sector). 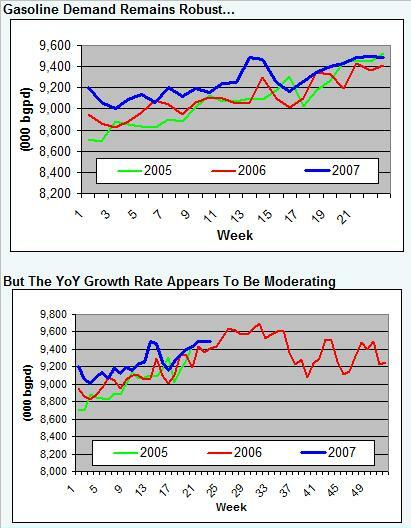 Take a look at the 2008 numbers for the refiners and then the '08 numbers for the major service guys to see what I mean! Sure the refiners are cheaper but they're supposed to be! Here's a sample. Want more reasons for the OIH to do well? Here's one torn from the headlines. (CVX) postpones drilling at it's deepwater Gulf of Mexico Jack Prospect due to rig shortage. It's estimated to hold a half billion barrels of oil but they can't get to it now because rigs are more urgently needed elsewhere. The rig was actually pulled off this prospect temporarily for development drilling on another project and while they thought drilling would resume in August, it has now been postponed to late '07/early '08. Even a company doesn't postpone a half billion barrel test, let alone interrupt one without good reason. smack talking OPEC ministers (and yesterday their president who said the world is well supplied), etc, etc, ad nauseum, ad nauseum. Gasoline: Expected up 1.5 to 1.7 million barrel increase. Actual: FLAT. Why? Because Utilization actually ticked down again? No. Production wasup and demand was off slightly. The answer lies with the volatile imports number. Utilization Looks Odd In Light Of Production and The EIA's Own Crib Sheet. The EIA's utilization number appears disconnected from reality since the production was actually up reaching the 9.3 million barrel I was looking for (1.3% over year ago levels). In fact, PADD I (East Coast) SET A WEEKLY PRODUCTION RECORD OF 2.014 MM BPD. If that's not bad enough, utilization, by a count of what was announced and reported by the EIA, should have been up. They're either missing some major announcements, which is hard to believe given the production levels or something else is amiss. Ah Here's The Answer, Imports Backed Off Big Time. Gasoline imports fell from 1.51 to 1.16 mm bpd this week. Is it the start of the seasonal pattern where Europe competes more directly for gasoline or just a blip? My money is on a blip and that high prices here will result in another 3 or 4 weeks of big imports before they start to fall off for the rest of summer. By then, utilization needs to be cranking. Recall that imports fell sharply four weeks ago due to a veritable traffic jam in the Gulf Coast before rebounding to the third highest level on record. My Number: 95 to 100 Bcf. Consensus: I'm told the range is wide enough to steer a tanker though: 88 to 113 Bcf. While it would take a number far below that range to keep from again shrinking the YoY deficit I think the over / under for gas prices hinges at 100 Bcf this week. I laid out my argument for a Week to Week decline in Tuesday's piece here. In a nutshell, continued lower imports and weather that week to week was pretty similar should yield a slightly smaller injection. Analyst Watch: I''ll add in morning comments. (CHK) Took half my position off the table at $1.00 for an 18% gain. Then watched (CHK) run the rest of the day. The other half of my botched trade here remains a little less under water today. I'd roll this AFTER inventories today if I were going to be around to watch it next week. TSO June 60s sold for a buck. 68% loss on a 2x position. I still hold the July $57.50s which I'll leave in play while I'm out. 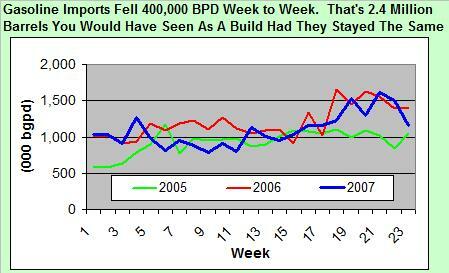 New Oil Sands Player Watch: (TCK) plans to produce 140,000 bopd (from 0 at present in 10 years). That's ~ 40% of (SU)'s current production. Could be one to watch people flock to. Press release on it reads like a kid on Christmas day who woke up early and stole all the other kid's toys. This entry was posted on Thursday, June 14th, 2007 at 12:56 am	and is filed under Uncategorized. You can follow any responses to this entry through the RSS 2.0 feed. You can leave a response, or trackback from your own site. My gut feeling going into NG report day is that we will see higher prices. With a sub 100 , we could see a 10 cent up move. Bill – it was an f slip. thanks. North Sea: Shell and BP scaling back activity in the North Sea. Zack’s Analyst Blog is highlighting HAL, saying the valuation discount should substantially narrow (I agree) or go away entirely (I doubt) to SLB. They site the spinout of KBR and moving the headquarters as reasons and a recent award to HAL of a Saudi Aramco project. IAEA says ability to monitor Irans nuclear program is deteriorating. Iran says it’s nuclear program has gone too far to turn back now. Fear is again rising that Iran will disrupt oil supplies if new tougher sanctions are passed. They could only afford to do so for a very short time…with cameras rolling…but it would jack oil > $70. Bill – fast on the trigger as always. Over 100 Bcf and it’ll lose this ground fast. CHK – new all 52 wk high. Check out the monthly chart. Looks to me like a base from 10/05 to present that we are starting to break out of. Given its prospects and valuation it could easily test $39 in coming weeks (if gas prices hold up). ANR looks pretty attractive right now as well on strong nat gas demand and a hot summer expectation. The stock just got done resting and looks higher. Does anyone like BQI here? BQI A guy I haven’t seen around here in awhile, AM, really thought it had potential. He was on top of the story but it’s languishing with a lot of the little guys while the mid and big cap names add market cap almost daily. Probably a good long term hold and maybe good for leaps. All of their news has pointed to progress although I don’t know what year they start production. What’s up with the spread on the $30 CRK calls. Bid below intrinsic…buttheads. GRP running hard as OIH sets its sights on 175 and then probably 180 if today’s gas number is bullish. Why is gasoline up so strongly today? RBOB inventories have been flat for awhile and it’s really a small percentage of total gasoline production which has been running so strongly. The daily 2 to 3% amongst the refiners is unjustified. Still, if you’re short a pair with a cheaper one like VLO calls is in order. I’m tempted to take a little more END here. I’d be near my limit for a little one like this and over it if I didn’t like the fundamentals so much…they’re trading at less than 2x forward CF. I will be patient because it’s probably dead money until earnings (mid July) but some new players may decide to start nibbling prior to the next bit of guidance which could push the stock back into the $1.70 – $1.80 territory. Nicky – I saw quite a few refinery problems last night. Do you think this morning’s strength is just follow through on yesterday or a they (RBOB traders) in serious rally mode? =< 95 Bcf bullish: thinking SWN, KWK, CHK, HAL, GRP, yes even here! if we get a real pop LNG would tempt but I'd wait for a storm to short. Thanks Nicky, that’s excellent stuff! got lucky on ng, bought 4 on the way down, as low as 7.60,7.61,7.62, just sold most em all last one at 7.73. CHK call volumes running hard post number. CRK still up a paltry $0.36 today. Really like this growing, low cost, gassy name. Nice job Bill! See you late June. HK and PQ performing nicely. Both at all time high. Nicky! Party pooper. LOL. 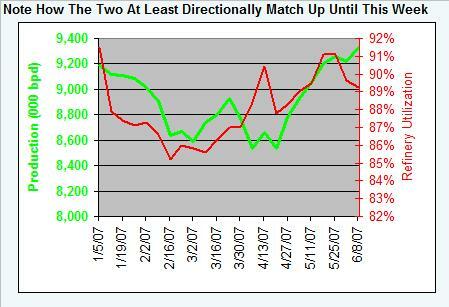 I agree on the technicals but what do you see as a sharp decline. You heard the kid on CNBC say it…natural gas traders are looking forward to summer heat and a hurricane. They must not live along the gulf coast. I have a very nice profit in VLO and I’m thinking of selling into this strength. Any other VLO longs looking at selling here? Nicky – agreed. I was just a little happy over my bullish numbers that bore out. With imports down again I was going to get a bit nervous if the injections didn’t correct. All is right with the world now. nat gas appears stalled. stocks with it. Mike – VLO will weaken with the others but probably not as much. I was using it as the long side of my paired trade with the more expensive little guys. When in doubt, sell half. Thanks zman. I’ll consider that. Nicky – Just saw the Flynn email. Thanks. I’m on the same page with Flynn on these “scientist” who work at a place called the “oil depletion center”. How can you come out with an unbiased report when you work at a place named that? They say four years. I ask, what did they say last year and four years ago? What is he talking about on the dist chart? That’s not right! consider selling calls on vlo to protect long position. Mike – I know it’s overly simplistic but if it travels higher you still have those profits and you haven’t really lost anything. I sold have my CHK yesterday for a buck. Small gain on that piece but so close to expiry I didn’t want to take the chance going into inventories. Could have sold it for $2 this morning and made a killing. Of course the second half of my pos made that trip so I’m not complaining. Besides, I’m in the camp that doesn’t habitually beat itself up over opportunities missed or a bad trade or two. I really try to look at each trade as just the first in the next 1,000 I’m going to do. Takes the emotion right out of it. I still get pissed but it doesn’t last that way. I know you didn’t ask for the market psyche lesson but I’ve been doing this for awhile and that’s one of the adages that seems to help. Cheers. Nicky, RBOB over $2.20. Nice call on the first leg comment yesterday. How much higher do you think we go (barring incident/storm). House passes it’s Energy Bill. Will be seen as bullish for oil and gas. Delays development of oil shale in the Rockies. Bill: Also good advice. I’ll consider that as well. zman: You have expressed EXACTLY what I have been TRYING to do, but it seems that emotion always rears it’s ugly head. I have seen profits evaporate many times over the last few months as I got a little greedy and yes I have beat myself up a little over it. I try and remind myself that I am a trader, but lately I have stayed in my positions too long. Many thanks for the market psyche lesson as I needed a good reminder of the bigger picture. Z– It always amazes me during option expy, when a optopn has one day left and its up 350% from the previous day and players are buying it ! Why would players buy something today that experis tommorow, Who they gonna sell to? and why would the buyers tommorow want it? PS I nibbled on some yesterday carzy like a fox, I felt, but I just wanted to play the follow through. PSS I just sold at 11:20, for a wopper of a gain! H – I don’t play that game (often). Prefer blackjack. They eventually either expire worthless, exercise the option or sell it back out to the person who wrote it in the first place. Nicky – $2.27 would be a very nice rally from here and painful for the refiner puts. I think it won’t top that unless we get another bearish look at utilization next week (which now looks likely) even though production keeps rising. Maybe imports bail us out. Somebody go fishing off the HSC this weekend and count the tankers. lol. UNG just bounced off it HOD but looks like it may take it out shortly. I’ll most likely cash my chips on the CHK position at BE shortly. Whoever had that DEEP idea is doing well. UNG breaking out a bit now…I guess with the oil complex on the run as well. SFY probably works real nicely as they pitch the sale of their NZ stuff. OIH rallying over 175. Needs to close over that. Next stop probably 180 before 170 in true T Boone fashion. N – exactly. Still not good for the refiners with the WTI to RBOB differential closing a little. The money in these stocks is hot money and it likes up commodities even though days like today (and this week) yields another slide in gasoline cracks. Tiny SCU up on news it’s presenting at CAPP on June 19th. Sorry I’ll miss that. Hey Nicky. Do you know the price spread between the ULS Diesel and the >500 ppm variety. Do people plan on burning the ULS or the mid grade for home heating next fall? If not, then those inventory levels really stink. Putin Watch: Russia plans to cut exports by 170,000 bopd for 3Q07. Z- Any last thoughts re APC & FTO ? APC – I’d take profits soon (I already have and I like the company here but it’s had a good leg for an options play). Ah FTO. I’d not DD on $35s. I bailed on my TSO Junes yesterday fearing the end of week follow through we’re getting now. Sometimes expensive stocks stay expensive. The imports hiccup really rallied gasoline despite the higher production but the pace of RBOB’s run is not outpacing that of WTI’s. I’m looking to own more puts when I get back but I’m doing nothing but watching it right now and shaking my head. If you’re in the 35s I’d punt and reposition next week (or not depending on the data). Also I’d tread lightly here as I was just beginning to get short again and am exposed very small. I think gasoline stocks will resume building next week although utilization may not rise again and that seems to be what people care about. The other thing is that I wouldn’t be just naked short the sector right now. I like VLO long with any of the three small, expensive names in the group but I think FTO trades and works the best. Hope that helps. Just concerned that it might not. Looking at the EIA nightly reports there was a period, say the last two weeks were announced refinery restarts strongly outweighed closures. And we got two down utility numbers. The last couple of reports have shown several more closures and little in the way of restarts. Not a feeling we’ll fall, just one that maybe we don’t get back over 90%. Given the way the numbers are playing out it would make more sense if people focus on production but we both know that not going to happen. Those OIH Calls I brought on friday for 85 cents are now worth $5.40 !!!! Damm I ahve no brains! I’m the one that mentioned DEEP. Fundementals look good to me going forward. Went from 4 to 9+ ships. IF something happens in the GOM this summer, I’ll get a quick 50% pop, but otherwise, I’m in for awhile. FYI – I’m long NE, FCX, COSWF, POT, RIG, DBA, ENOC, GBX, and a few smaller oil/gas postions. I will lighten up 1/2 of my postions sometime in July/August. When the crowd (They are coming back in now)starts to bail (See August 2006), I’ll be gone til Sept/Oct when I’ll go back in. If RIG goes below $80.00, load the boats on that cycle. Z, love the site. Sambone – You’re a player! That’s a nice list and a little off the beaten track in some cases. I see POT in there, ever play the fertilizers against natural gas? Glad you like the site! Suggestions for improvement or stock ideas to check out are always welcome. At least they will be when I get back. Have you checked out NGS for compression? Interesting. 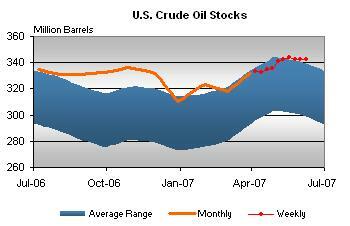 Also the newbie, CLR, the oil Oklahoma equivalent of CHK? UNG making another run and CHK along for it. About to cash the second half of my position there. Chinese oils PTR, SNP, CEO en fuego! Easy H. There’s always tomorrow. Z- Thanks for your advise. Sold APC august 50c @ 4.70=35% profit. Owned them for 9 days. I am satisfied. Will hold july 35p. Not worth selling at current bid/offer. Scoop – sorry it wasn’t better. Gotta bop, back before the close. That little WHT is interesting here, starting to pick up a little. I own a very little…this is the one with wells in and around FST acreage that is seen as highly prospective in E Tx. Z – I keep it simple, just do my research. I try to look for things that the street misses/specials. I’m mostly fundementals, but I do look at charts. KIS. Been in the oil/gas patch since 03. My numbers tell me that CHK could go to $45.00 by mid July, but then I’m out 1/2 of my postions across the board. My avg cost on CHK is $14.00. Owned it since 04. This stock has traded sideways since 05, that’s why I’ll take some profits this summer, and then buy back (Hopefully) at a lower price. Take a look at how much the Chairman has been buying in the past two+ years. When will you be back from your trip? Sambone – Aubrey has the best deal in the oil business for a chairmen. He used to have a working interest in every well they drilled as part of his job. Don’t know if he still does but he’s one of the richest oil men in the business. Just got passed up when CLR went public… take a look at that one. I like to put my experience this way. I was Buyside, then Sellside (E&P analyst), now I’m on Yourside. Back on the 25th and unfortunately (or not) I’ll be completely out of pocket next week. I am just a young kid trying to learn a little, but what do you think about taking a straddle on HK. The $15 call has an ask of $1.6 and the put has an ask of .10. ALL THE BEST ON YOUR TRIP. watch your step,and get the shots, and bottle water only! I def. retract my previous comment having not realized that the third Friday this month was tomorrow, not next week. Please feel free to ask any questions you’ve got though. With regard to HK that’s one of my small cap E&P favorite names and I plan to do short reports on them PQ, and CRK when I get back after the 25th. H – Thanks. Got the shots, definitely bottled or canned everything and I’m Ok with the stepping as I’m pretty far from the still partially mine Nicaraguan border! Lije – I know you’re off the trade but I thought I’d give my opinion as if you weren’t for illustrative purposes. I definitely would not go with a long straddle as the name is just not that volatile and you’re subject to pinning action close to expiry. I might use one of those around the date of PQ’s Atchafalaya well announcement in 3Q07 once I pin that date pretty closely down. As a rule, Long Straddle = Big events WITH a stock that’s not always volatile but historically capable of great volatility. Perhaps you were thinking short straddle. That probably makes more sense for pinning time but it is a bit of gamble with much the same unlimited loss/limited return aspects of short selling. As I rule I don’t do these because I once had some bad luck with them but I know people who make very nice, very quick profits playing this game close to expiry. It’s that one unexpected PR that kills you here. Thanks Z, I really enjoy this site and have sent a link to most of my co-workers and professors. I feel like I have learned more about the energy industry from this site than I have my job, which is in Energy.